Stem canker girdles the sunflower stem at soil level, causing the plant to fall over. We’ve received reports from some sunflower growers of plants falling over in the field. While the initial concern was for herbicide damage, the symptoms did not match. Closer examination revealed environmental and mechanical issues producing heat canker. Sunflower root with limited growth due to compaction breaks at the soil level due to stem canker damage. 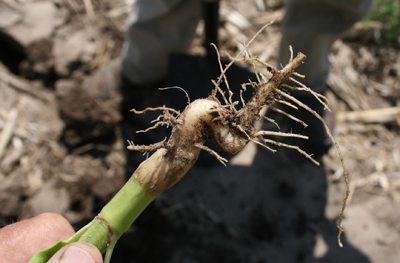 Soil compaction can restrict or change sunflower root growth and limit or reduce plant health. Poor plant health allows heat canker to have a greater negative impact. 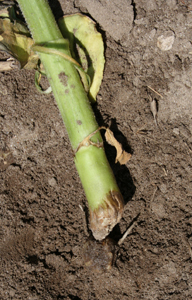 Heat canker results when stem tissue cannot withstand high soil surface temperatures. death of the young plant. The constriction can be pronounced or severe. The girdling bulge (just above the constriction) may or may not be pronounced, but the end result is that the plant is structurally weakened and likely will topple. Often heat canker can greatly reduce stands of flax, canola, sunflower, and sugar beets, especially in semiarid regions. Other plants, such as wheat and barley, can experience heat canker while emerging, but the damage is less visible and the growing point is not affected. Any damage to sunflower is most serious because the growing point is above the injury — it will not recover. When the plants are larger, outer tissues are injured and plants respond by producing additional cork-like tissue as an overgrowth to the injury. This area at the soil line is brittle and is vulnerable to late season stresses such as strong winds. Along with high soil surface temperatures, heat canker is more likely to occur in compacted soils and darker, clean-tilled soils that have crusted from rain. These conditions with hot, windy weather provide the constrictive force that injures the plant. Moving soil particles can compound the constriction. Soil compaction contributes to this by limiting plant growth and weakening the plant and its ability to withstand the constrictive forces causing heat canker. To limit the occurrence of heat canker, reduce soil temperature and/or reduce the damaging constrictive force. A crop canopy producing shade will reduce temperatures so early planting and a good final stand are important. In addition, a surface mulch will reduce the expansive nature of the soil while residue will almost eliminate the adverse effects of high temperatures, soil, and wind. To avoid soil compaction and its contributing effects, avoid tilling and planting in wet soils, especially with sweeps. In compacted soils, the root mass can stop at that soil depth and results in the tap root moving horizontally and not utilizing sunflower’s expansive root system. Anxious preparation can be costly in the end.